Payment21®, a global provider of AML-compliant Bitcoin payments, has been honored at the 2016 Constantinus Awards, winning the award for ‘Best International Project. The panel of judges selected Payment21® along with RISE, its IT-advisor and engineering provider, from the pool of nominees. A total of 152 projects were evaluated by an 80-person jury. During an exclusive dinner gala, the winners were celebrated together with their customers. More than 700 guests attended the ceremony of the industry-specific “Oscars" for the Austrian IT and consulting sector at the Design Center in Linz. 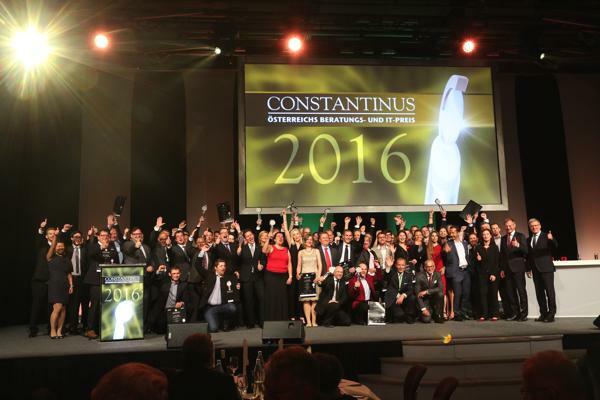 The renowned Constantinus Awards were handed out for the fourteenth time to the best IT and consulting projects in Austria. Payment21® won in the international projects category for its Bitcoin Cashier System designed to support AML-compliant cross-border transactions around the globe. The award recognizes Payment21® as an industry leading product innovation. RISE GmbH shouldered the responsibility for engineering backend software components, the e-commerce cashier application, and its exchange service including the technology stack and the IT-architecture. Jury members from corporate business and the media found the project both novel and compelling. The teams at both RISE and Payment21® have collaborated intensively for a period of 8 months to develop the first release of an AML-compliant Bitcoin Cashier system based on superior IT-security and state-of-the-art payments technology to effortlessly support collection and exchange services throughout global markets. Backed by its proprietary payment gateway that links consumers and businesses directly with payment schemes, exchanges and banks, Payment21® offers user-friendly interfaces for e-commerce and mobile usage, along with safety-related products to drive market adoption. Working with Payment21® allowed RISE to contribute to the ongoing technical paradigm shift taking place in the financial industry. Since 2009, innovators in the FinTech sector have introduced block chain technology that advances the evolution from e-money to digital money, also known as crypto currency. Requesting a banking software provider such as RISE to build a Bitcoin gateway appears to be a unique approach. Typically, Bitcoin companies hover around the Silicon Valley-style start-up community. In the case of Payment21® and RISE, two well-established firms accepted the challenge to build a gateway for merchants with specific regulatory requirements that meet the needs of regulators, banks, and customers. Accepting AML-compliant Bitcoin transactions is nearly impossible for regulated businesses today because processors do not have the required know-how or the necessary technologies in place. The ability of Payment21® to deliver a secure processing solution based on AML-compliant Bitcoin technology is reinforced by its recognition at the 2016 Constantinus Awards. The international aspect of the award allows Payment21® to further expand its value proposition in emerging markets where financial inclusion is an urgent priority. According to a 2015 World Bank report, the number of “unbanked” individuals worldwide has reached 2 billion adults. Therefore, financial inclusion represents a tremendous opportunity for economic growth. The Bitcoin Cashier System addresses the needs of the globalized financial service industry by meeting the demand from consumers widely excluded from cross-border activities. Moving Media is the owner of the Payment21® brand and a registered financial intermediary providing AML-compliant crypto currency transactions. The company’s Bitcoin Cashier System provides payment processing services to e-commerce platforms around the globe. Payment21® service offerings are focused on regulated businesses who need effective compliance procedures. The target group includes publicly-listed e-commerce merchants, licensed gaming enterprises, audited charities, and concessionary wireless network providers. Payment21® is committed to building trusted networks and making the digital payments ecosystem compliant, secure and more user-friendly. Behind the Payment21®-brand are talented employees who continually raise the bar with innovative solutions that deliver convenience and price advantages via online channels. The company is headquartered in Switzerland.